Before I knew it Wednesday had arrived and I was shattered. The trip to Piccadilly Circus felt longer than usual (I may or may not have falled asleep, which was incredibly disorientating) and by the time I was in the cinema I was in need of a hot cup of tea or coffee. Luckily, there was plenty on offer, and it was fine, but nothing compared to a Starbucks. As I drunk it down and ate a couple of danish patries, I made a note in my head to visit a Starbucks later on. This was the final day of screenings, and all four films turned out to be better than expected. 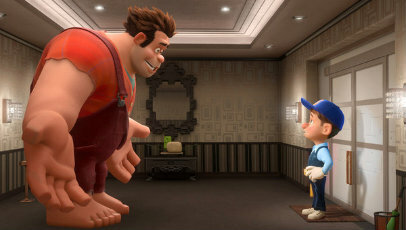 The first, Wreck-It Ralph, was the pick of the day, and I cannot wait to be able to talk enthusiastically about it. It’s a keeper. The others were fine, but by the time the last one finished (Pierce Brosnan can act), it was clear that a hotel meal was in order. It was time to spend a little money and get myself something substantial. Emma and I went to the same pub as the other night, where we collapsed and re-energised ourselves with glasses of Pepsi and food, glorious food. The sitting down over the past few days had clearly taken its tool, as we then found ourselves wandering around the streets of London for the next two hours, chatting about life, Twitter and professionalism. It’s clear I need to make a few changes not only to how I approach life in general, but also to how I present myself online. No more unnecessary updates. It was a chat that made me think about more than we spoke about, and I owe a lot to Emma for bringing some things to my attention and making me see that life needs to be lived, and not constantly worried about. Two hours later and many realisations later, it was pub time. Emma and I walked over to The White Horse on Rupert Street where we spent the next three hours drinking with a large collection of other bloggers. I met a few more people, most notably Adam Lowes and Jamie Dunn, and three ciders later I was drunk and on the tube back to my hotel for the last time. It was sad to think the next day I’d be returning to Scotland, but the experience so far was one I’d not be forgetting in a hurry.